sleeping accommodations for up to 10 people. 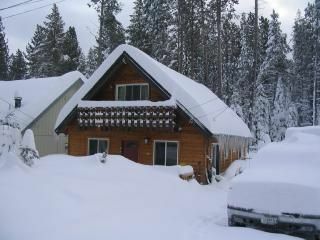 The cabin is minutes from Heavenly Valley Ski Resort, the Lake and the Casino Area. It is about a 20 minute drive to Sierra Ski Ranch. There is Taxi Service available. bedrooms and a full bath downstairs. We liked staying here. The cabin has everything we needed and owner is very responsive. We were able to fit 4 cars (2 civics and 2 outbacks) into the driveway. 1) We were not able to heat the living room higher than 60-65 and the living room floor felt cold, so better bring your warm socks if coming here during winter. Bedrooms though were heated just fine (felt like 70+). 2) The fact that one has to dry and put dishes back to cabinets before check out is a bit inconvenient if one wants to leave ski early on Sunday. Aside from these two things I have no concerns and can definitely recommend the cabin as the place to stay. Thank you for your review and for renting our property. We will check into the heat in the family room. Sometimes the heater vents get covered with furniture and the room doesn't heat as well. We love staying at the Bresee's cabin and have been regular tenants for many years. The cabin is perfect for a family holiday, cozy, warm, convenient and always clean upon arrival. The rooms are spacious and we enjoy the open kitchen and living room area. Perfect location for walks in the meadow and easy access to South Lake Tahoe and nearby ski resorts. Rita and James go out of their way to ensure you have a great and relaxing stay. We highly recommend and guarantee we will be back again!! Cleaning Fee $150.00(includes basic cleaning/linens/snow removal) Security Deposit $250.00 or buy insurance through website Occupancy Tax is included in the fees.